Commercial undercounter refrigerators and freezers are the solution to keeping ingredients cold and frozen in your busy commercial kitchen. They’re Ideal for small restaurants, bars, food trucks, concession stands, Espresso stands and more. These undercounter refrigerator units help keep key ingredients close by at all times. Look for models by True, Beverage-Air, Turbo-Air, Delfield, Superba and Avantco. 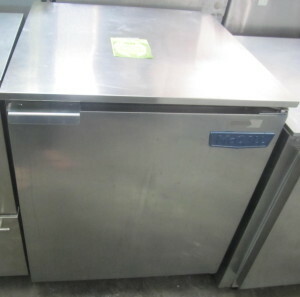 Dealing with limited space can make things hectic in a high-traffic commercial kitchen, so maximize your real estate with this Beverage Air UCF48A 48″ undercounter freezer! 6″ casters promote easy mobility for undercounter cleaning, while brakes keep the unit stationary during use. It has two self-closing stainless steel doors that reduces temperature loss, and a stay-open feature for high-volume loading and unloading. The Beverage Air UCF48A 48″ undercounter freezer consistently maintains temperatures below 0 degrees Fahrenheit, thanks to its 1/3 hp compressor and 2″ thick polyurethane insulation. The stainless steel exterior and anodized aluminum interior also boost the unit’s energy-efficiency and are easy to wipe clean. Two epoxy-coated shelves are also included so that your products can be well-organized to promote shorter open-door times. 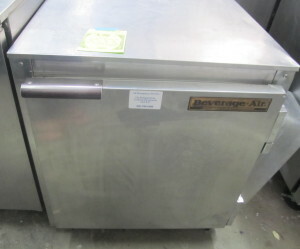 The Beverage Air UCF48A 48″ undercounter freezer requires a 115V electrical connection and is UL and NSF Listed. 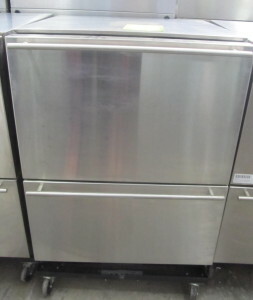 This Under-counter Refrigerator has a stainless steel top, front, and door for maximum durability. The door opening features a low-wattage anti-condensate heater that reduces condensation, and the unit is insulated with high pressure, foamed-in-place, closed cell polyurethane which minimized energy consumption. Versatile, compact unit. Forced-air refrigeration system with high humidity evaporator coils. Internal thermometer. 1⁄6 HP. 8′ cord and plug. 24″ wide, available in all-refrigerator or all-freezer, features full stainless steel cabinet-for built-in or freestanding use. 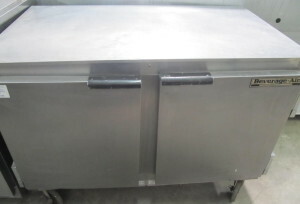 The wrapped stainless steel drawers, professional stainless steel handles and fan cooled compressor are built for heavy use.